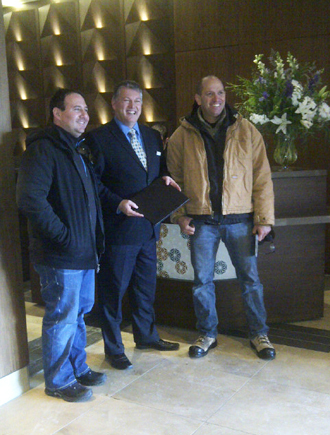 First DoubleTree by Hilton Hotel and Conference Centre Regina Guests, David Adler (left) and Rick Swanson (right) pictured here with General Manager, Mike Wurster. REGINA, Saskatchewan and MCLEAN, Va. (November 05, 2013)— DoubleTree by Hilton today announced the opening of DoubleTree by Hilton Hotel and Conference Centre Regina, marking the debut of Hilton Worldwide’s globally-renowned hotel brand into the market. The hotel, formerly the Regina Inn Hotel and Conference Centre, unveils property-wide upgrades following a 10-month, multi-million dollar renovation that includes a total refurbishment of its 235 guest rooms, 18,000 square feet of flexible conference space and a new full-service restaurant. The hotel is owned and operated by SilverBirch Hotels & Resorts. Conveniently located in downtown Regina, just six kilometers from Regina International Airport, DoubleTree by Hilton Hotel and Conference Centre Regina welcomes guests with a fresh new look that pulls from the city’s beautiful rustic aesthetic juxtaposed with modern, industrial design touches that can be seen throughout the warm and inviting lobby, guest rooms and food and beverage areas. A dramatic 18,000-square-foot, state-of-the-art conference centre is designed to accommodate varying event needs with 11 technologically-advanced and ergonomically-designed conference rooms and a ballroom to accommodate 400 guests. The hotel also debuts Wild Sage Kitchen & Bar®, a new, full-service restaurant that celebrates farm-to-table dining with a menu inspired by fresh, locally-sourced ingredients to create memorable meals using the regional flavors of Saskatchewan. For a more casual dining experience, the hotel offers a laid back lounge and bar and in-room dining service. As part of the SilverBirch Conference Centre® experience, meeting attendees will also enjoy the Connections Café® offering free Wi-Fi, espresso machines and an incredible assortment of indulgences including smoothie shots, fresh fruit and vegetables, pastries and healthy treats. Among the DoubleTree by Hilton brand exclusives that guests will enjoy are the Wake Up DoubleTree BreakfastTM, an assortment of gourmet in-room tea and coffee offerings from The Coffee Bean & Tea Leaf and a refreshing array of CITRON body care products by Crabtree & Evelyn. All rooms have upgraded amenities and feature a mini-fridge and a 42-inch flat screen TV. Additional hotel amenities include a 24-hour fitness centre, 24-hour business centre, and complimentary internet access throughout the hotel and guest rooms. Hilton HHonors members will now be able to earn and redeem points for stays. Diamond HHonors members will receive 1,000 bonus points and free breakfast during stays, and Gold HHonors members will have the option of receiving either 1,000 bonus points or a complimentary continental breakfast during their stay. To mark the opening, DoubleTree by Hilton Hotel and Conference Centre Regina will offer double HHonors points for stays completed between December 10, 2013, and March 1, 2014. For reservations or to inquire about meeting packages, travelers should visit www.doubletree.com, contact their preferred travel professional or call 306-525-6767. Media can access additional information at www.regina.doubletree.com. Find more news about DoubleTree by Hilton hotel openings at http://news.doubletree.com. With a fast-growing, global collection of more than 360 upscale hotels in gateway cities, metropolitan areas and vacation destinations across six continents, every little thing we do at DoubleTree by Hilton inspires us to create a rewarding experience for our hotel guests, our team members and the communities we proudly serve. Our hospitality begins with a warm chocolate chip cookie welcome upon arrival and continues with the award-winning Hilton HHonors guest loyalty program, an array of fine services and amenities and our longstanding CARE Culture tradition that empowers more than 65,000 team members to provide the special comforts and acts of kindness that make the traveler feel human again. SilverBirch Hotels & Resorts is one of Canada’s leading hotel management companies and manages over 20 hotels and resorts across Canada. The company manages independent hotels and hotels operating under major franchise brands, such as Marriott, Radisson, Hilton, Quality and Best Western. For more information visit www.silverbirchhotels.com.